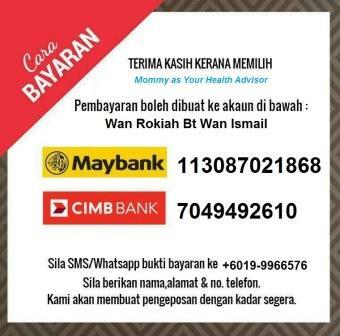 Ok, tahu kan, badan kita banyak toksik? Pelbagai sebab yang berada disekeliling kita mengundang gejala yang tidak sihat pada badan. Contohnya, dari pemakanan, habuk, persekitaran dan sebagainya. 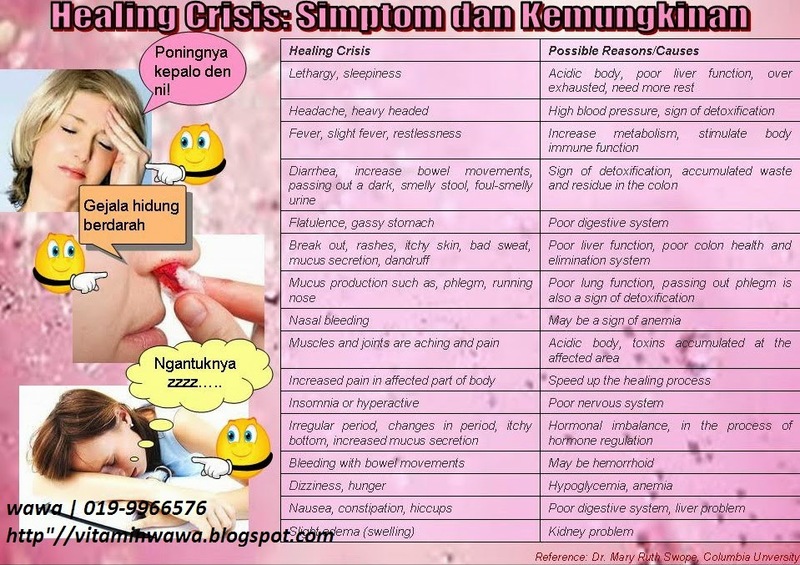 Kenapa dan bagaimana terjadinya healing crisis ni? Since most people base their health on how good they feel, they may think the natural health program they are using is hurting them when a healing crisis takes place. But nothing could be further from the truth. A healing crisis, or healing reaction, is a temporary worsening of symptoms that occurs when the body is going through the process of healing itself through the elimination of toxins. It occurs when the body “retraces” old injuries, wounds, infections or other imbalances from its past. A healing crisis has many different names. Some of these include: healing reactions, flare-ups, retracing reactions, detox reactions, Herxheimer reactions, Jarisch-Herxheimer reactions, die-off reactions, the reversal process, Lucio’s Phenomena, purification reactions or a crisis. A healing crisis is an important aspect of an effective natural, deep healing process. Even though the crisis is uncomfortable and sometimes alarming in nature, a healing crisis is a good sign that the body is working to heal itself. If a particular therapy does not produce a healing crisis, an alternate therapy may be required to accomplish the detoxification necessary to overcome illness and disease. The symptoms that accompany a healing crisis may include: headache, flushing, skin eruptions and/or boils, fever, nausea, joint pains, feelings of being spaced out, unusual fatigue, insomnia, sleepiness, congestion, strong emotions, depression, irritability, muscle cramps, aches and pains, constipation, diarrhea, hot/cold flashes, night sweats and many other symptoms which are often cold and/or flu-like. A healing crisis will often bring up past issues, “retracing”, that have been dormant in your body for a long time … past illnesses and disease may re-manifest as the body eliminates the toxins that have been stored from those disease processes. Symptoms can be quite intense when the healing crisis is dealing with serious past illnesses and disease such as an old case of hepatitis, shingles, viral infections or pneumonia. The symptoms and pain of the healing crisis are often more intense than the disease or illness that is being treated. Remember, it is only temporary. And it is the path to renewed health. A healing crisis usually lasts two to three days, but can extend for much longer periods of time, even weeks. More than one healing crisis may be necessary for a complete cure to take place. When dealing with a more serious illness or disease, such as cancer, you may have to go through many healing crises before full health can be restored.